During the last years, terms like acetabular retroversion, excessive overcoverage, and abnormal head-neck-junction with the so called “pistol-grip-deformity” has been added to the classical description of hip dysplasia. These anatomical changes could lead to a femoroacetabular impingement (FAI). Both kinds of FAI has been indentified as a main reason for hip pain and progressive degenerative changes leading to early osteoarthritis of the hip. A lot of radiographic criteria on pelvic views have been established to detect classical dysplasia and FAI. The present study was initiated to assess the hypothesis that age and severity of osteoarthritis affect measurements of different radiographic parameters. The pelvic radiographs of 1614 patients were measured for head-ratio, CE-angle, roof obliquity, extrusion-index, depth-to-width ratio, CCD-angle, sharp’s angle. To evaluate the severity of osteoarthritis of the hip the classification by Kellgren and Lawrence was used. Associations between age and radiographic parameters or severity of osteoarthritis were assessed by Spearman’s (ρ) or Kendall’s (r) rank correlation coefficient, respectively. 366 (22.7%) patients presented no sign of osteoarthritis, 367 (22.7%) patients presented I° osteoarthritis, 460 (28.5%) patients presented II° osteoarthritis, 307 (19%) III° osteoarthritis and 114 (7.1%) IV° osteoarthritis of the hip. The mean head-ratio of all patients was 1.13 ± 0.26 (0.76 – 2.40), the mean CE-angle 40.05° ± 10.13° (0° - 70°), the mean roof obliquity was 35.27°± 4.96° (10° – 55°), the mean extrusion-index was 12.99 ± 9.21 (6.20 – 95.2), the mean depth-to-width ratio was 59.30 ± 8.90 (6.30 – 100), the mean CCD-angle was 127.68° ± 7.22° (123° – 162°) and the mean sharp’s angle was 9.75° ± 5.40° (1° - 34°) There was a weak association between age and the severity of osteoarthritis of the hips (left: r = 0.291; right: r = 0.275; both P < 0.001) with higher osteoarthritis levels observable for elderly patients). Severity of osteoarthritis has a negative impact on measurements of different radiographic parameters. Therefore - in our opinion - epidemiological studies on prearthrotic deformities should only be performed in healthy adults with no signs of osteoarthritic changes. During the last years, terms like acetabular retroversion, excessive overcoverage, and abnormal head-neck-junction with the so called “pistol-grip-deformity” [1–4] has been added to the classical description of hip dysplasia with a lateral CEA-angle of less then 25° and a roof obliquity angle of more than 10° . These anatomical changes could lead to a femoroacetabular impingement (FAI). Two kinds of FAI have been described. In Cam impingement a repetitive contact between an abnormal head-neck-junction and the acetabular rim causes cartilage damage in the anterosuperior area of the acetabulum. In Pincer impingement a direct contact between the femoral neck and a local/generalized overcovered acetabulum leads also to repetitive damage of the cartilage at the acetabular rim [6–16]. Both kinds of FAI has been indentified as a main reason for hip pain and progressive degenerative changes leading to early osteoarthritis of the hip [1–4, 6, 7]. The diagnosis of FAI should be based on detailed physical examination and appropriate imaging studies. A lot of radiographic criteria on pelvic views have been established to detect classical dysplasia and FAI [17–21]. The head-ratio has already described as reliable for the detection of “pistol-grip-deformity” [7, 8, 22]. It has also been shown that radiographic FAI findings are very common in a population of healthy young adults . Goodman et al. have shown that “pistol-grip-deformity” is due to a three-dimensional structural abnormality with no change in severity with age . According to Kellgren and Lawrence  progressive degenerative changes lead to osteophytes, narrowing of the joint space, and deformity of the bone ends. These changes may have a negative impact on radiographic parameters. The present study was initiated to assess the influence of severity of osteoarthritis on radiographic parameters. Ethical approval has been received by the ethic committee of Tübingen (025/2014R). We analysed our data bank for all pelvic-views which has been performed in our institution in the period between 1st January 2006 and 31st December 2011. To exclude the negative influence of pelvic tilt and rotation on radiographic parameters, only standardized pelvic radiographs were included in this study. The distance between the tip of the coccyx and the middle of the symphysis was 32 mm for men and 47 mm for women and the teardrop sign appeared symmetrical . The pelvic-views were measured for head-ratio, CE-angle, roof obliquity, extrusion-index, depth-to-width ratio, CCD-angle, sharp’s angle [8, 17–20, 22, 26]. In cases with the presents of a THA, fracture or Dysplasia Crowne II/IV on one side, only the other was measured. To evaluate the severity of osteoarthritis of the hip the classification by Kellgren and Lawrence was used . Statistical analyses were conducted with the use of IBM SPSS Statistics 21 and R software, version 3.0.0 (R Core Team). In order to account for repeated measurements of both hips on patient level, analysis was conducted separately for left and right hips or using summarized values for both sides (i.e. mean or maximum values of both hips). When analyzing the influence of age on severity of osteoarthritis different radiographic parameters, left and right hip were analyzed separately. When analyzing the influence of severity of osteoarthritis on the different radiographic parameters, the most severe hip and corresponding measurements or in case of equal severity on both sides, averaged measurements over both hips were considered for each patient. Categorical variables are presented as frequencies, percentages, and continuous variables as means and standard deviations, or medians and interquartile ranges (Box-plots) for variables with skewed distributions. 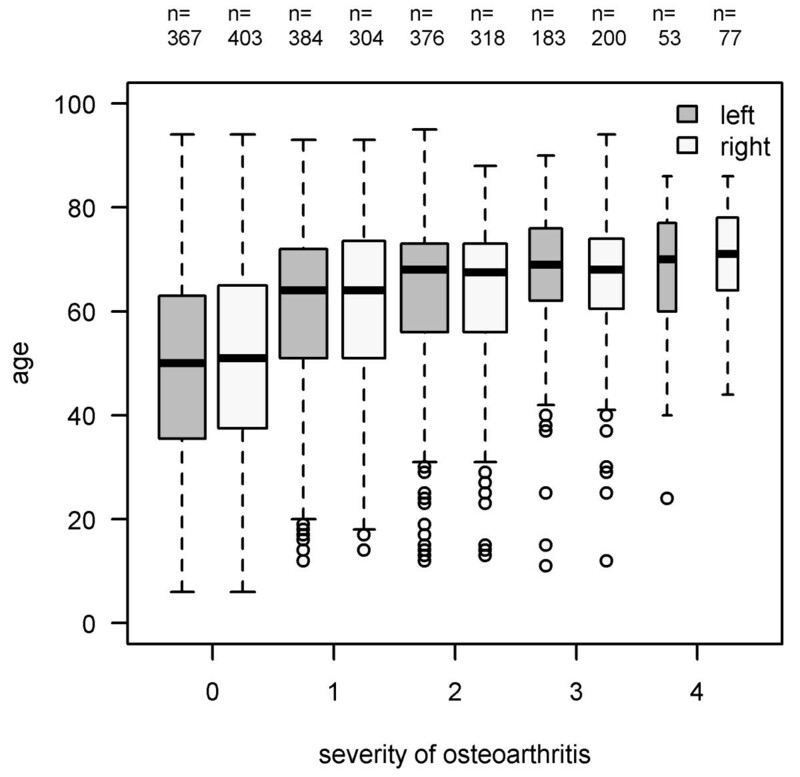 Associations between age and radiographic parameters or severity of osteoarthritis were assessed by Spearman’s (ρ) or Kendall’s (τ) rank correlation coefficient, respectively. Group comparisons based on severity of osteoarthritis of continuous measurements were conducted using either the one-way analysis of variances (ANOVA) or the Kruskall-Wallis test, as appropriate. All reported P values are two-tailed, with a P value of 0.05 indicating statistical significance and have not been adjusted for multiple testing. The pelvic radiographs of 1614 Patients were included into this study. In 1052 of all cases both sides were measured in 562 cases only the left (n = 311) or right side (n = 251) were measured for radiographic signs of FAI and dysplasia. The mean age of all patients was 60.2 years ± 17.1. 44.4% of all patients were male, 55.6% were female. 366 (22.7%) patients presented no sign of osteoarthritis, 367 (22.7%) patients presented I° osteoarthritis, 460 (28.5%) patients presented II° osteoarthritis, 307 (19%) III° osteoarthritis and 114 (7.1%) patients presented IV° osteoarthritis of the hip. The mean values of all different radiographic parameters are demonstrated in Table 1. There was a weak association between age and the severity of osteoarthritis of the hips (left: τ = 0.291; right: τ = 0.275; both P < 0.001) with higher osteoarthritis levels observable for elderly patients (Figure 1). The results are presented as means and standard deviations (Minimum – Maximum). Association between severity of osteoarthritis and age. 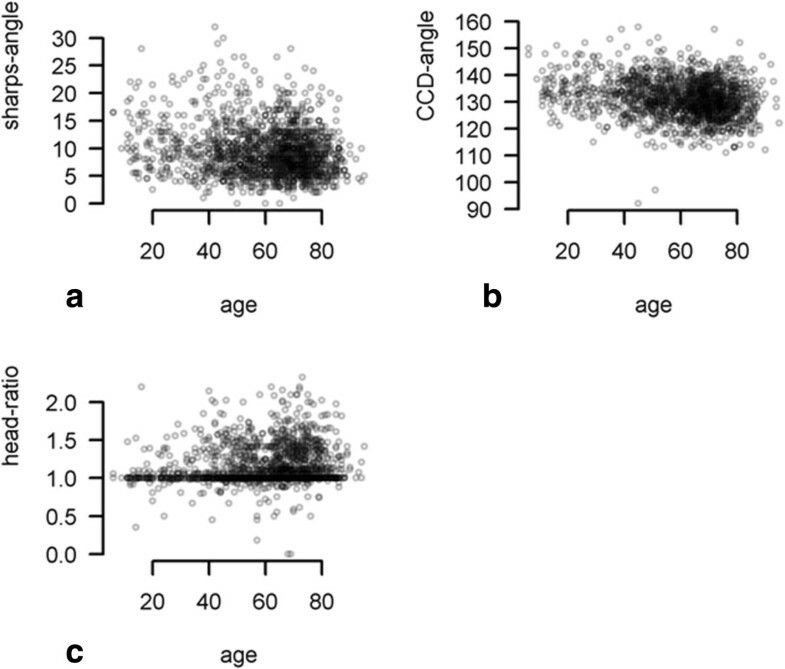 Y-axis: age in years, X-axis: severity of osteoarthritis according to Kellgren-Lawrence (Kendall’s correlation coefficient for left hips: r = 0.291; and right hips: r = 0.275; both p < 0.001). The correlation between age and head-ratio, CE-angle, roof obliquity, extrusion-index, depth-to-width ratio, CCD-angle, sharp’s angle is demonstrated in Figures 2 and 3. Weak monotone associations were also observed between age and mean CE-angle (ρ = 0.334) (p < 0.001), mean sharps angle (ρ = -0.299) (p < 0.001), mean extrusion-index (ρ = -0.218) (p < 0.001), and mean CCD-angle (ρ = -0.205) (p < 0.001). On the other hand no correlations were seen between age and depth-to-width ratio (ρ = 0.033) (p < 0.181), roof obliquity (ρ = 0.133) (p < 0.001) and head-ratio (ρ = 0.135) (p < 0.001). These results imply that age has only a weak or no impact on the different radiographic parameters for FAI and dysplasia. One-way ANOVA revealed statistical significant differences between patient groups based on severity (Kellgren-Lawrence 1°-4°) of osteoarthritis for the following measurements: CE-angle (p < 0.001), sharps-angle (p < 0.001), Extrusion-index (p < 0.001), and CCD-angle (p < 0.001). No statistical significant difference between patient groups based on severity (Kellgren-Lawrence 1°-4°) and depth-to-width ratio was seen (p = 0.535). Assuming a skewed distribution of head-ratio and roof-obliquity measurements, the nonparametric Kruskall-Wallis-test revealed a statistical significant difference between osteoarthritis groups head-ratio (P < 0.001) but none for roof-obliquity (Figure 4) (P = 0.18). These results imply that there is an association between the different radiographic parameters (excluded roof-obliquity and depth-to-width ratio) and the severity of osteoarthritis of the hip. Correlation between CE-angle, roof-obliquity, depth-to-width-ratio, extrusion-index and age. a: Correlation between age and CE-angle. X-axis: age in years, Y-axis: CE-angle in degree. There was a weak monotone correlation between age and CE-angle (ρ = 0.334). b: Correlation between age and roof-obiquity. X-axis: age in years, Y-axis: roof obliquity in degree. There no correlation between age and roof obliquity (ρ = -0.133). 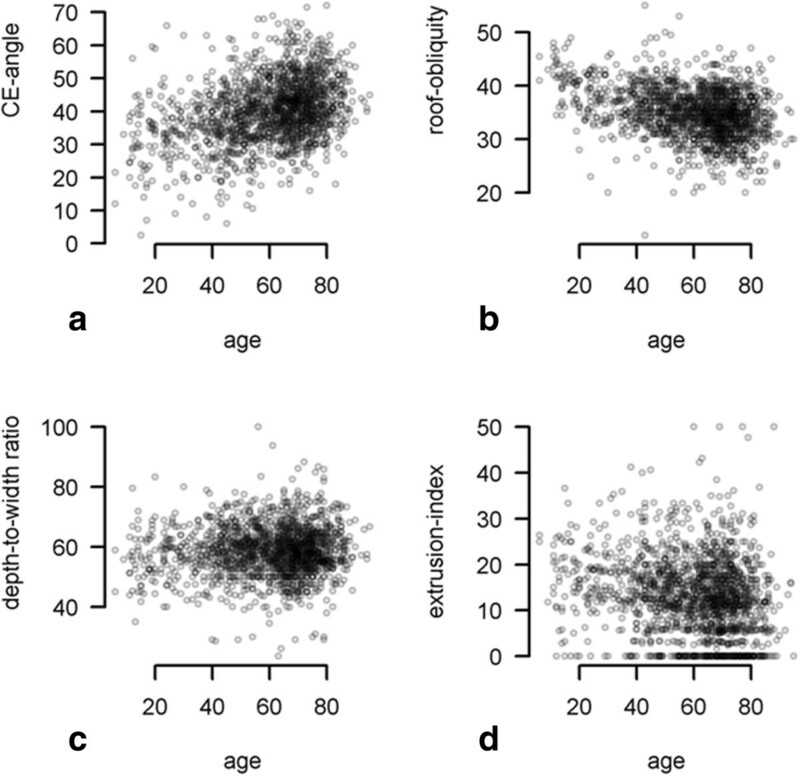 c: Correlation between age and depth-to-width-ratio. X-axis: age in years, Y-axis: depth-to-width-ratio in %. There was no correlation between age and depth-to-width-ratio (ρ = 0.033) d: Correlation between age and extrusion-index. X-axis: age in years, Y-axis: extrusion-index in %. There was weak negative correlation between age and extrusion-index (ρ = -0.218). Correlation between sharps-angle, CCD-angle, head-ratio and age. a: Correlation between age and sharps-angle. X-axis: age in years, Y-axis: sharps-angle in degree. There was weak negative correlation between age and sharps-angle (ρ = -0.299) b: Correlation between age and CCD-angle. X-axis: age in years, Y-axis: CCD-angle in degree. There was weak negative correlation between age and CCD-angle (ρ = -0.205) c: Correlation between age and head-ratio. X-axis: age in years, Y-axis: head-ratio There was no correlation between age and head-ratio (ρ = 0.135). Association between severity of osteoarthritis and radiographic parameters. a-g: Patient based measurement values of CE-angle, sharps-angle, Extrusion-index, depth-to-width ration, CCD-angle, head-ratio and roof-oblique by severity of osteoarthritis of the hip (Kellgren-Lawrence 0-4) [most severe hip and corresponding measurements or in case of equal severity on both sides, averaged measurements over both hips were considered]. a: X-axis: group 0-4 according to severity of osteoarthritis, Y-axis: CE-angle in degree. There was a statistical significant difference in the CE-angle between the groups (p < 0.001). b: X-axis: group 0-4 according to severity of osteoarthritis Y-axis: sharp’s angle in degree. There was a statistical significant difference in the sharp’s angle between the groups (p < 0.001) c: X-axis: group 0-4 according to severity of osteoarthritis Y-axis: depth-to-width-ratio in%. No statistical significant difference between the groups was seen (p = 0.535). d: X-axis: group 0-4 according to severity of osteoarthritis Y-axis: extrusion-index in%. There was a statistical significant difference in the extrusion-index between the groups (p < 0.001) e: X-axis: group 0-4 according to severity of osteoarthritis, Y-axis: roof-obliquity in degree. No statistical significant difference between the groups was seen (p = 0.18). f: X-axis: group 0-4 according to severity of osteoarthritis Y-axis: CCD-angle in degree. There was a statistical significant difference in the CCD-angle between the groups (p < 0.001). g: X-axis: group 0-4 according to severity of osteoarthritis Y-axis: head-ratio. There was a statistical significant difference in the head-ratio between the groups (p < 0.001). During the last years a lot of studies have shown changes in the acetabular geometry and the head neck region as a main reason for an early osteoarthritis of the hip. Terms like femoroacetabular impingement have become more and more important in the explanation for hip pain and the early development of OA. These morphologic changes in the acetabular geometry such as an excessive overcoverage or an acetabular retroversion or changes in the head-neck-region lead to the so-called Pincer- or Cam-impingement [6–18]. However, the “classic” definition of hip-dysplasia with an undercoverage of the femoral head (reduced CE-angle) or a steep acetabular roof (increased roof obliquity) is still playing an important role in the indication of total hip arthroplasty in young adults [26–30]. While watching different epidemiological studies, an abnormal hip morphology with acetabular dysplasia has been reported in about 51- 80% of all cases with OA of the hip . Including radiographic findings for an excessive overcoverage of the femoral head, acetabular retroversion or an abnormal head-neck-junction, as a dysplastic change, hip-dysplasia was seen in nearly 97% of all patients . The prevalence of acetabular dysplasia has been reported to be about 3.8% in the British population  and 4.5% in Chinese men . An abnormal head-neck-junction seems to be present in about 40%-50% of all hips with OA [26, 30]. A recent study has shown a high prevalence of radiographic finding for FAI in a cohort of 2081 healthy adults. The prevalence of CAM-impingement was up to 40%, the prevalence of Pincer-impingement up to 50% . The present study was performed to assess the impact of severity of osteoarthritis on different radiographic measurement values. We were able to show that degenerative changes has an negative impact on radiographic parameters for FAI and hip dysplasia. To our knowledge this was the first study focusing on this topic. The posterior head tilt in osteoarthritic hips has been discussed as being an acquired deformity created by the formation of osteophytes . The present study support these findings, as the head-ratio demonstrated an increase with the severity of osteoarthritis. On the other hand it was shown that this deformity did not change with age and therefore it could be seen as a prearthrotic deformity and not as secondary to degeneration . We not several limitations in this study. A testing on intra- and interobserver reliability hasn’t be performed in this study, but previous studies already focussed on this topic . Clohisy et al. and Gosving et al. reported about poor results for inter- and intra-observer reliability of measurements of radiographic signs for acetabular dysplasia, head-neck offset and pelvic tilt. Other studies were able to show a high inter- and intraobserver reliability for different radiographic parameters by using the Balnd-Altman-method [26, 31, 34, 35]. The discrepancy between these studies could be explained by the using of different statistical methods. The kappa-coefficient by Cohen  is the first choice for testing inter- and intraobserver quality of categorical variables, it should not be used for data on a continuous level [34, 35]. Correlation coefficients for testing reliability between two observers should not be used at all . Therefore the Bland-Altman-method is a better choice for assessing agreement of continuous data [34, 35]. Nevertheless the inter- and intrabserver quality of radiographic findings in the diagnostic of dysplasia, FAI and excessive overcoverage is one of the main problem in the clinical routine. Therefore the use of a three-dimensional imaging might be helpful in unclear cases. There seems to be a negative impact of severity of osteoarthritis on different radiographic parameters for the detection of femoroacetabular impingement and hip dysplasia. Therefore - in our opinion - epidemiological studies on prearthrotic deformities and radiographic paramters for FAI and hip dysplasia should only be performed in adults with no signs of osteoarthritic changes. II: Drafting the manuscript IR: statistical analysis SS: graphical design, recruiting x-rays EB: performing measurements RS: controlling accuracy of measurements and quality of x-rays FM: Study design. All authors read and approved the final manuscript.